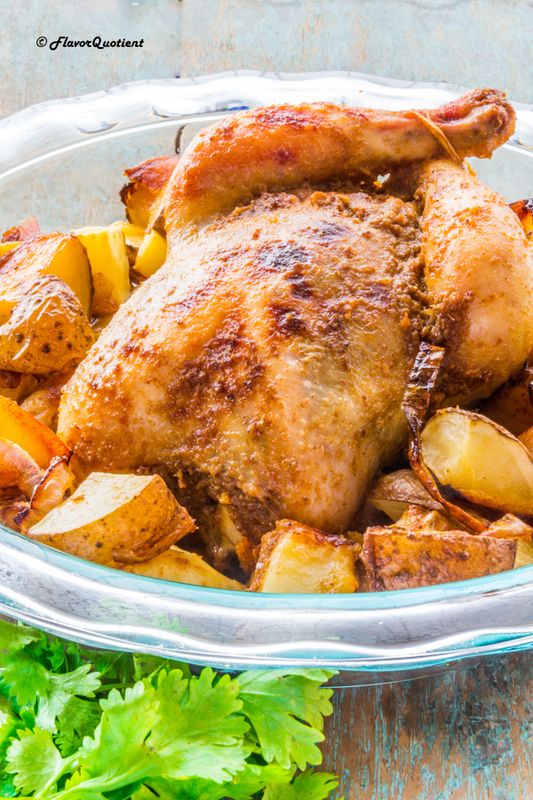 A spicy makeover on the classic whole roast chicken! The chicken is super juicy with the right kick of spiciness! Internet is flooding with roast chicken recipes thanks to the upcoming Thanksgiving Day and I too could not escape the temptation! 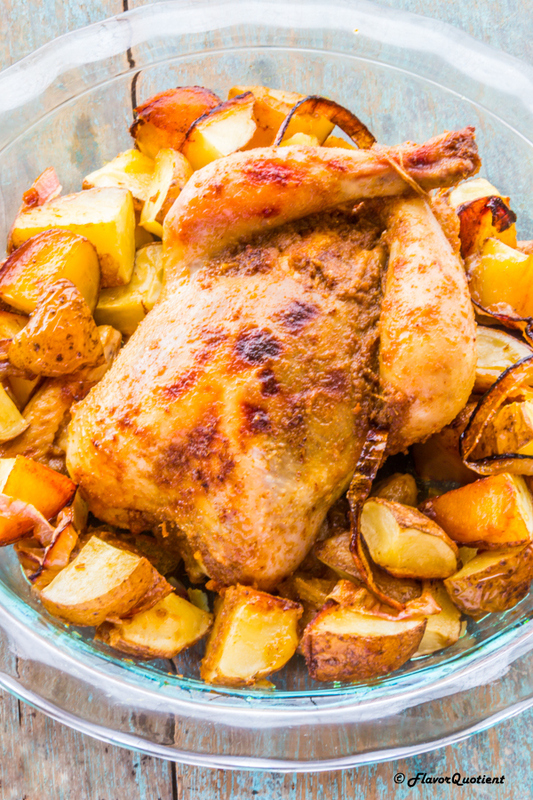 Roast chicken is always a family favorite and we keep looking for excuses to make this at home! And what better timing could it be than now! This time I thought of enhancing the spice quotient of the whole roast chicken compared to my earlier recipe which I shared a while back. 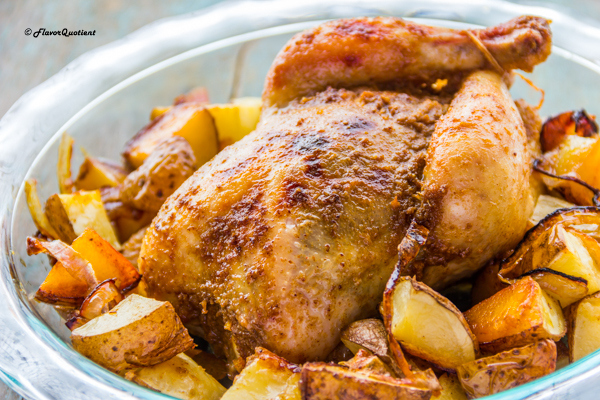 That one was the classic whole roast chicken and this is the spicy counterpart of the same! After lot of hours on internet, I finally decided to make my own version of the rub for chicken. I didn’t have any fresh herbs, like thyme, rosemary, handy. So I decided to skip the herbs this time and use a blend of spices to create a unique flavor. To be honest, I was bit worried about how the spice blend would complement the final whole roast chicken but I went ahead with my gut feeling. And thank God I did! It just turned out to be simply fantastic and irresistible! I used a blend of celery salt, paprika, ground coriander with garlic paste and unsalted butter. Celery salt is my new-found love and I am getting addicted to it with each passing day! I bet you will too once you start using it. The ground coriander adds a depth of earthy flavor and the paprika adds the kick of spiciness complementing each layers of flavors. You guys can just trust me on this and give this a go! This is so good that it alone can steal the show of your next house party! Preheat the oven at 200 C / 400 F and place the grill rack at the center of the oven. Peel and cut the onions into ½ inch thick slices. Place the potatoes and onions on the roasting tin in a single layer. Drizzle with olive oil and season with salt. Mix and make sure to keep everything in single layer only. Wash and pat dry the chicken thoroughly. Lightly season it with salt and pepper on both sides and inside the cavity. Prepare the rub for the chicken by mixing the softened butter with celery salt, paprika, coriander and garlic paste using a fork making sure the spices are mixed homogeneously. Rub the chicken all over with the prepared butter-spice rub using a brush. Then place the chicken on the roasting tin over the potatoes and onions that you had arranged. Roast/grill the chicken at 200 C for about 1 hour and 15 minutes or until the internal temperature of the thickest part of the chicken (which is around the joint of thigh and leg) registers 165 F on an instant read thermometer. If you don’t have a thermometer, cut the chicken and check if the juices are running clear and there is no pink left in it. Also if you try to insert a toothpick, it should go in smoothly without much of resistance. Your chicken is then properly cooked. Let the chicken rest for 15 minutes before carving. To carve the chicken, first cut the joint between leg and thigh. Then separate the thigh and the wings. Finally take out the breast meat an reserve the breast bones for soups/stews. 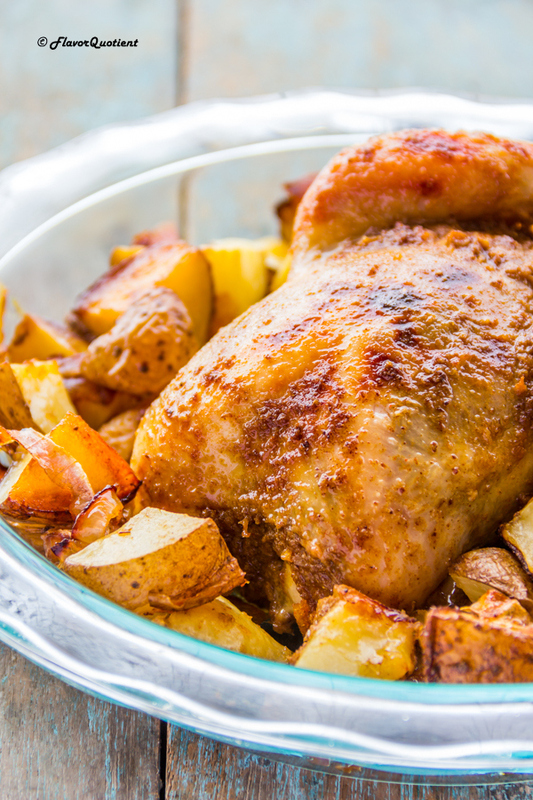 Serve hot with the roasted potatoes and onions.